This blog contains affiliate links and ads. 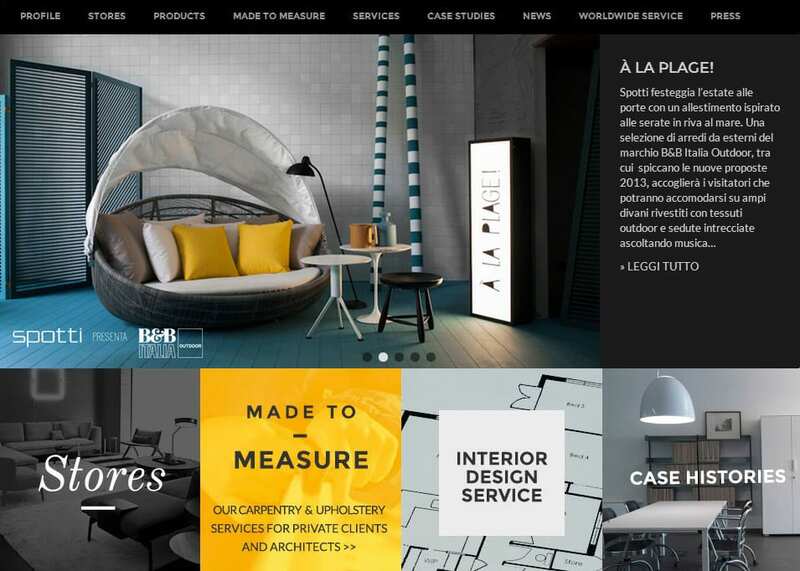 The high end furniture and Italian design showroom, Spotti has a new website, completely renovated with a new graphic and new interior design, consultancy and products. The site is in 5 languages; Italian, English, Russian, Portuguese and Chinese. Worldwide shipping can be arranged. The images are spectacular, with multiple views, front, back and side views as well . Each product page also includes the product available in other colors. The kitchen and private wardrobe sets are inspirational! How I wish my house looked like the Spotti catalog! Spotti is a high-end retailer, you cannot just click and order. You can request prices and shipping fees online by filling out a form. Or you can print product details and visit or call the showroom and they will help you with your inquiries. Special services are offered for private clients, architects, and contract deals as well as wedding lists or gift vouchers. They will help you with everything from laying out your living space to choosing the right upholstery. For more ideas you can visit the “Case Study” section that has more inspirational photos for your home decor dreams. The Spotti store has been in the heart of Milan, close to Porta Venezia, in the Fashion Quarter, for more than 20 years. Milanostyle is the general profile of Milanostyle.com. Some posts by Milanostyle may be of a commercial nature and written and published as a collaboration. This, however, does not in any way affect the quality of information provided. For more information, read the Mianostyle.com policies or contact us. Milanostyle.com is a private website and blog providing information about travel, culture, and traditions in Milan, Italy. © 2019 Milanostyle. All rights reserved.